The common practice in mastering anything you set your mind to do, is to draw lessons from other people that have followed similar footsteps. When it comes to Instagram, that’s about the best place to start in order to succeed. We all aspire to have more influence, yearn to be discovered and want to put our brand out there. Is there a secret sauce to Instagram? You bet. You might remember our previous post on how to market yourself on Instagram, and this time around, we bring even more tips and insights. 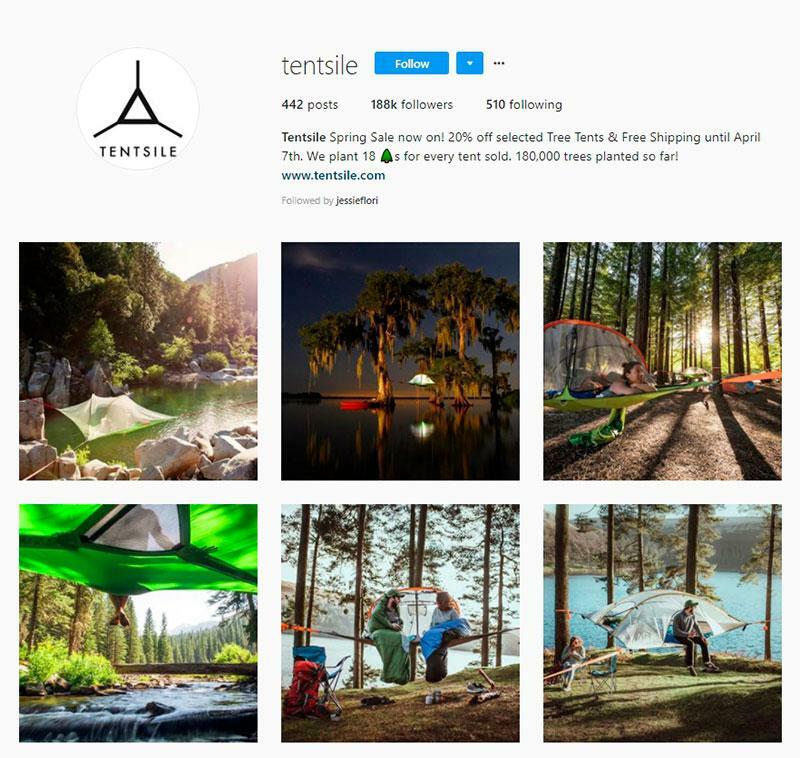 To uncover what it is that makes Instagram pages successful, we look at some of the top brands to see what they’re doing and implementing. Some brands that have made a name for themselves have acquired real followers, continue to inspire real engagement and beautifully curate their accounts which in turn adds even more fuel to brand recognition. There aren’t as many factors involved as you think. There is a handful of tactics that can help you grow your audience and gain more engagement and followers in the process. These reputation-building tactics can be applied to your own account or come in handy in promoting your brand. A common piece of advice that you’ve probably stumbled on is that all your images should be high-quality. However, there’s more to it than just posting high quality images. You have to create a coherent Instagram account that has a vibe and showcases your aesthetic. This is important because when users glance at your feed and see a consistency in style, they’ll more likely follow you knowing what to expect and because they want to see more content based on what they extract from the look of your page. Aesthetics and cohesion is something you have to work on consistently. Take a look at your account, and archive old images that don’t seem to fit in to your theme. Having a distinct look makes you memorable so you might have to put in some work and clean up your page. We often talk about coherence and how important it is when you have an Instagram page. 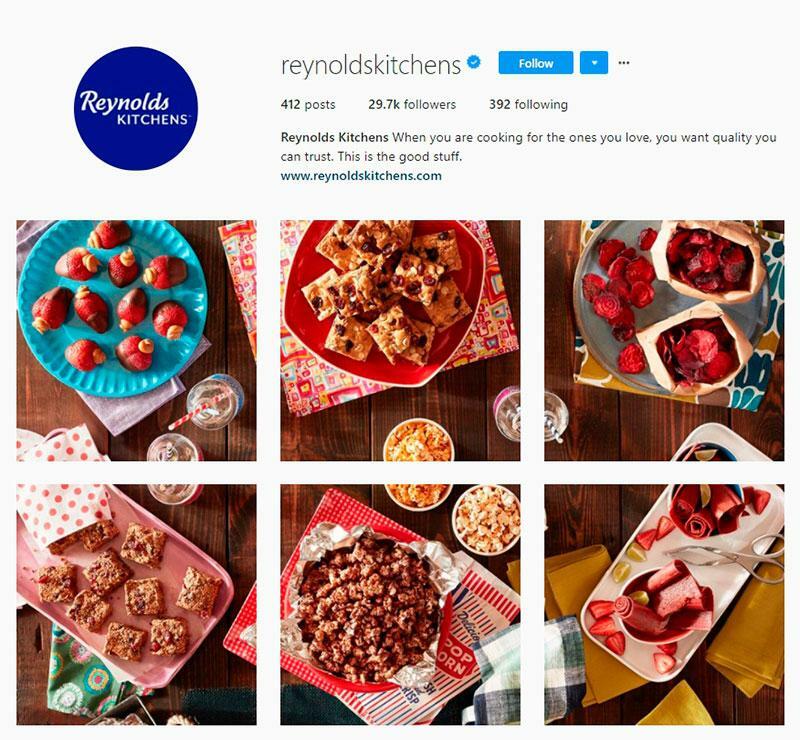 One brand, Reynold’s Kitchens, uses basic appliances to curate their page to perfection. The beautiful Instagram feed is a never-ending table featuring different products. It’s a great example of a simple idea and great marketing that really took off as a result. Whether you like it or not, you have to put more thought and research into hashtags that will work for your account. If we step back a little, you need to be absolutely on point with your bio, profile picture and everyday things like a selection of hashtags, adding locations to your posts and the like. If you have a business account, you need to make sure that everything is simple and straightforward. You have to present your users with a way to get to know you in a few lines, give them a place to refer to for more information (your website) and leave a way for everyone to get in touch. Whether you’re reading this for your own purposes or to help you with your brand’s account, remember that these basics are very important in moving your brand or personal account forward. 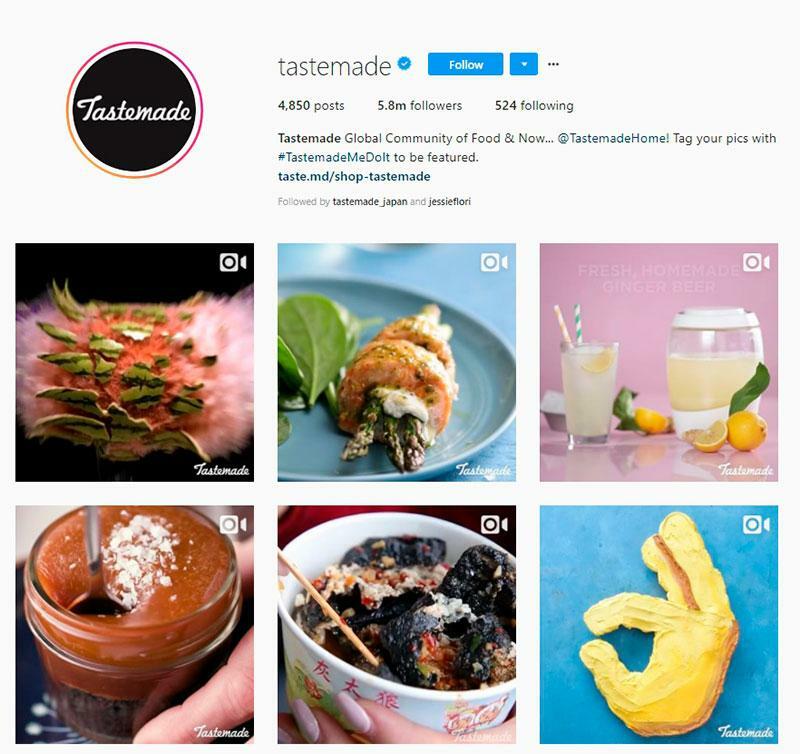 There is a lot of experimentation with Tastemade, and you’ll notice that the account features all sorts of food, but all of it is shot in a similar style as submitted by users. On top of being super coherent, it showcases a really innovative approach to marketing. Their bio is very simple, providing a hashtag that lets users be part of the feature and a website that redirects people to the bigger picture. You can settle for just posting and engaging with users, but in order to succeed, you have to use all the available tools and features and experiment a little. Then, experiment some more. It’s not a ‘must’ for you to use absolutely all the features, but it’s worth trying to see if it brings results. Instagram Stories and Live Stories are a great way to get some more exposure and give your followers an opportunity to get to know you or your business. It’s a chance to let your personality shine through and a great way to connect to new audiences. If users like what they see, they’ll follow you and want to keep up with your activity. Going live on Instagram is a bit easier when it’s your personal account, however if you’re running a business account, share some tips, get a little creative and take your users behind the scenes. Take the opportunity to use this feature to show a more relatable side to your brand. Loft does an amazing job of constantly updating their story and experimenting with going live. The content is also very engaging, relateable and entertaining for the users. 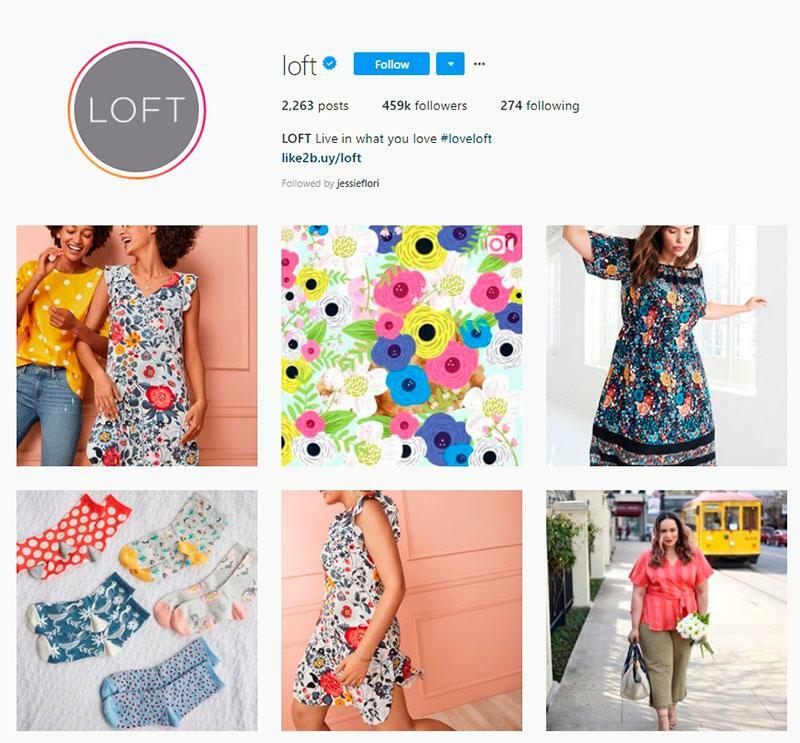 Loft managed to do something incredible – providing an enhanced digital experience that brings users closer to the brand. On top of seizing opportunities with new features, you have to be active on the platform. You have to both engage your users with your voice and register and be engaging yourself. This means answering messages, comments and paying attention to your followers and their needs. Take time to ask questions and even more time to answer them and address your followers, providing a meaningful interaction. One of the ways you can be more engaging is to change your register and write captions that are inviting and friendly. People should be able to read your captions and feel connected. When you become friendly and relatable, you’ll see a surge in engagement from your audience. You have to get a little creative. Instead of saying something like “Buy this course today”, try to be more relatable and specific like, “Did you guys always want to learn (insert activity) but never had the time to do so because of your schedule? Check out this course that will help you with (insert activity) and if you like it, pass it on to your friends!” It is much longer, but trust that people will take the time to read a longer message if they are interested in what you have to offer. Tensile is an adventurous brand that holds many lessons for us all. On top of promoting a good cause with their products, you’ll notice that most of their posts are user generated. UGC is a great way to reach out and expand as well. To engage their followers, they often include promo codes in their post captions which is quite a great tactic to get others excited about a product. Note how attentive they are to all the positive feedback. As for acquiring new followers, you can only do so after you’ve successfully implemented the aforementioned tips. Once you have a solid account that is consistent, coherent and inspires engagement, you can run an ad or two to test it out. Once you’re expanding, organic reach will not be enough. 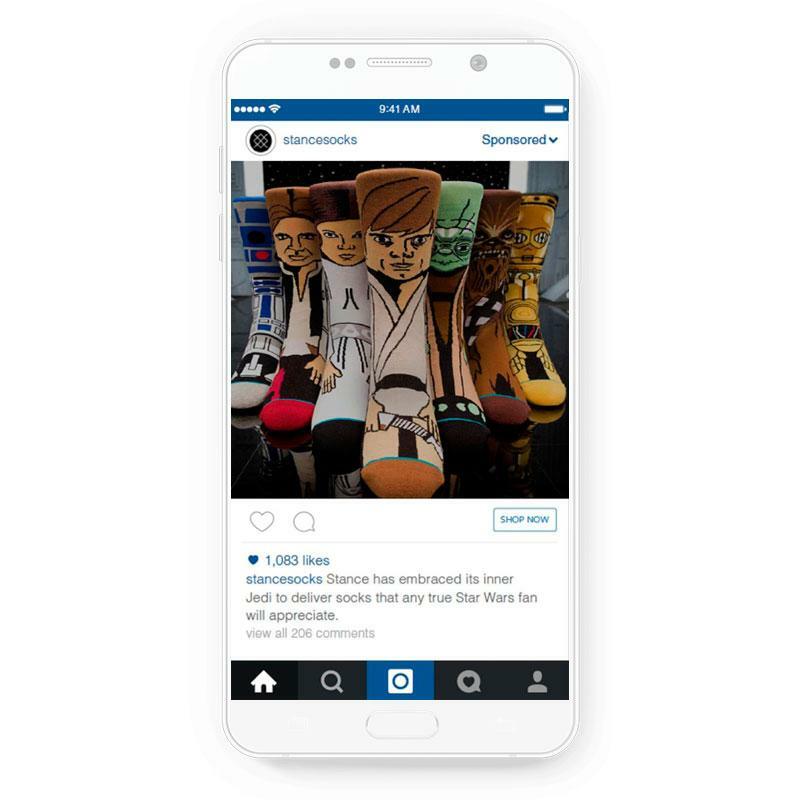 To accelerate things, invest time into Instagram ads but be sure that you have a clear course of action, so as not to waste your resources. Ads will bring new followers and even more users that are genuinely interested in your page. If your experiment proves successful, you can count on ads to further accelerate your growth. You can refer to this article to learn how to run ads using Facebook ads manager, or read up on cost effective tips for running Instagram ads. Here’s a particular ad that is targeted at a very specific audience. The reason why it’s such a successful ad is because the socks are adorable, it’s a very clean image that quickly communicates what the business is, what it does and what they have to offer. The ad leaves one with no questions and successfully markets the goods. It’s a great example of how a single image can actually determine your success when targeted at the right market. Once you get down to business, so to speak, you have to invest time into analyzing your results, which is why switching to Instagram for business is a great idea. On top of getting interesting insights into your target audience, you also get to see which posts perform better in comparison so you can use the information to tailor a better Instagram strategy. That’s about it! Of course, the success of Instagram accounts varies from business to business just as it is also true that it varies from individual to individual. Trust that there are some formulas to success that are universal, as it is the precise game plan for some of the most famous brands out there on Instagram. If you’d like to learn more about promoting your Instagram account or have your own tips you like to share, let us know in the comments section below.